This extraordinary theatrical event is the passion project of Bill Rauch, my longtime collaborator. It was reimagined several times, from a The Actor’s Theater in Los Angeles, to Yale Repertory Theatre in New Haven, and finally to the Oregon Shakespeare Festival in Ashland. MMC grew out of Bill’s interest in understanding what great plays throughout theater history might have in common. He chose a Greek tragedy, an Elizabethan drama, and a great American musical and discovered that they shared quite a lot thematically (ambition, royalty, sorcery) and structurally. The result is a theatrical tour de force in which the plays sometimes unfold simultaneously, and at other times spill into one another—with each work intensifying and illuminating the other two. 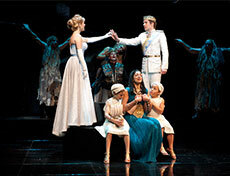 The choreographic challenge of this production was formidable. 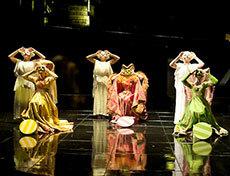 In order to help the audience follow the three separate simultaneous plays, I created a distinct movement style for each play that could identify it visually and support it thematically: The delightful and humorous language of musical theater for the Cinderella cast; stylized, ancient, choral movement (in mask) for the Medea cast; and a physical life built on the rooted, warrior ideal for the Macbeth cast. Then I embarked on the compositionally challenging task of combining the worlds, refining the visual storytelling and composition in collaboration with the directors so that the plays wouldn’t just coexist, but could illuminate each other and reveal what they have in common. In addition to the movement that flowed in and out of the scenes, there were 25 production numbers to which I strived to bring originality, depth, humor and beauty! 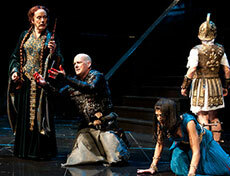 See photos from the production of Medea/Macbeth/Cinderella at Yale Rep.